Joseph Smith was the founder of Mormonism. At age 20 Joseph was tried in court and found guilty for falsely claiming that he could find hidden treasure. When Joseph was 26 years old he claimed that at age 14 he was visited by God the Father and Jesus Christ. He also claimed that at age 17 he was visited by an angel named Moroni, who told him of a book buried in a nearby hill that contained the history of the ancient inhabitants of the Americas. He then claimed that at age 21 he obtained the hidden book, made of gold plates written in Reformed Egyptian, for which he also claimed to possess a supernatural ability to translate it. 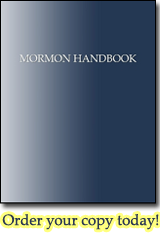 In 1830 he published the Book of Mormon, his alleged translation of the alleged gold plates. Afterwards that same year he claimed to receive a revelation that he was to be Prophet, Seer and Revelator of the new Mormon church. Three years later Joseph secretly married his second wife, on his way to taking as many as 48 wives. After Jane Law rebuffed Joseph Smith's proposal to marry him, her husband, William Law, was excommunicated from the church. Mr. Law was Joseph's Second Counselor. In protest, Austin Cowles, the First Counselor left the church. Both published testimonies condemning Joseph's polygamy in the Nauvoo Expositor. Joseph Smith then ordered the newspaper's printing press destroyed. The governor of Illinois stepped in and had Joseph put in jail, where he was killed by an angry mob in protest.